Not a bad CPU for £49.99. 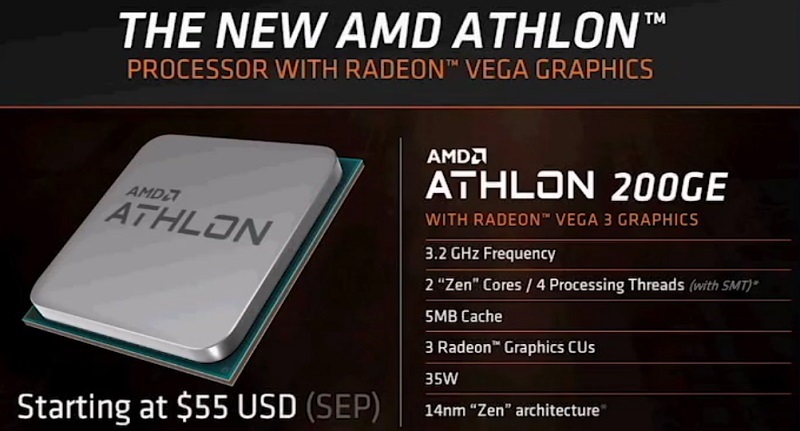 Read more about AMD's Athlon 200GE becoming available in the UK. It is a shame that nothing ever really happened with AM1. Strange to think that today's consoles are still using Jaguar CPU cores, albeit eight of them. It was definately something that made sense at the time, as it beat the PS3/Xbox 360 and going with Bulldozer cores would have meant more heat, bigger coolers and higher wattage PSUs, all of which would increase the cost of the consoles. The fans on an Original PS4 can already get plenty loud, hell, even my PS4 Pro can get fairly loud depending on the game. It will be interesting to see how the Sony/MS go with the PS5 and Xbox Next (2? ), as Zen makes a lot of sense. Stronger per-thread performance would be great for future games, but going for eight cores again would make for a fairly big die when combined with a big GPU. Well, the way I see it, doing a Zen 2 quad core would easily smash current console performance, but I'd say a hexa core would be the sweet spot for size, cost and longetivity. 8 core would make sense for a Pro model but that's about it. It all depends on how they plan to implement backwards compatibility. Backwards compatibility is currently a killer feature on Xbox One, especially on the X, so I think Microsoft will be considering an 8-core. Perhaps Xbox One backwards compatibility could be done on a quad-core eight thread CPU, but at the same time developers will want the new consoles to offer more CPU power. Remember back in the early days of Xbox 360 and PS3, where games experimented with in-depth physics in titles like Far Cry 2. Today devs are somewhat CPU constrained on consoles, so higher-end hardware would be good for them. It would be nice to see things pushed on the CPU front a little, rather than rely solely on the GPU for innovation. Well you always want to be GPU bound. That's the goal at least. It's much easier to work on and has less restrictions to game play.